DeMarkus Jones – In the last few weeks we lost quite a few great boxers to retirement. Timothy Bradley, Tyson Fury (maybe) and two names sure to inspire debate amongst boxing fans. Juan Manuel Marquez and Wladimir Klitschko. Both had long stellar successful careers. Both are Hall of Fame worthy. However should they be remembered as two of the greats of this era. I shall provide the facts and let you guys decide. 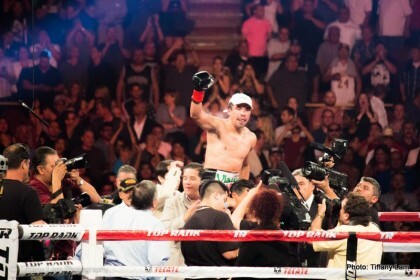 Juan Manuel Marquez will be remembered mostly for hia series of stellar encounters with Manny Pacquiao. His career is much more than those four fights. I definitely believe he should be considered on of the greats of this era based on longevity, success, entertainment value and pure guts and quality of opposition I believe Marquez should be considered one of the best boxers of this era. First off Marquez was never in a boring fight. Not only that but he was in many classic wars. His fights with Diaz, Pacquiao and even guys like Katsidis were all instant classics. The fact that he was a technically sound boxer who was willing to stand and trade made him even more marketable. Also despite all those wars Marquez was never stopped in a career that was 24 years long and spanned 3 decades. In that career Marquez amassed 8 world titles in 4 different weight classes. He was the third Mexican boxer and the 13th overall to hold a major title in 4 weight classes. Marquez at one point was the #2 p4p boxer in the world. He is one of the best Mexican boxers of all time and definitely one of the greats of this era. Dr. Steelhammer’s place is a little harder to debate. The successful record is definitely there. His 23 title defenses are only second to Joe Louis in the Heavyweight division. At 4,383 days he owns the longest combined championship reign of any heavyweight. From 2011 until 2013 either Vitali or Wladimir had possesion of every major heavyweight title. From 2006 until 2015 if affectionately known as the Klitschko era. Wladimir’s record stands at 64 wins with 5 losses and 53 ko’s. From a success standpoint you can not argue his place in history. He checks the longevity box as well. Boxing from professionally from 1996 until 2017. As recently as his last fight against Anthony Joshua he did not look old at all. He faired very well and even at times looked like he may have beaten his younger, bigger, stronger opponent. He looked better in defeat than he as ever looked. I would pick Klitschko to beat most of today’s heavyweights. The marks against Klitschko are his fighting style, quality of opposition and chin. Kiltschko has always been considered a “boring” fighter. Despite his very high 82% ko ratio. His style is described as safe, soft, defensive or scary. “Jab and grab” was the label given to the Klitschko style. While Klitschko is a very impressive athlete with tremendous size and power in his right hand. He fought very tactically. Relying on technique rather than his physical gifts. A fact that never endeared him to american fight fans. His quality of opposition was also a question mark. Klitschko fought in one of the weaker heavyweight divisions. Lacking the star power of the 90’s or the skill and tenacity of 70’s. Not to mention pf his 5 losses four were by k.o. To opponents Klitschko was favored to beat. With the exception of Lamon Brewster Wladimir never went back and fought a rematch with one of his conquerors. Big brother Vitali normally did that for him. However you can only fight who is there for you to fight. Similar to Larry Holmes you cannot hold his era against him. Klitschko never ducked anyone. He fought and beat nearly everyone placed in front of him. At the end of the day you cannot argue with history. You may not agree with how he did it however WladimirKlitschko spent the better part of a decade dominating the marquee division in boxing. His numbers rival the greatest to ever lace up a pair of gloves. He belongs right up there with the greats of this era and heavyweight history. So there you have it I believe we lost two of the greats of this era. You guys be sure to tell me where you think these two rank amongst the greats. You are here: Home / Boxing News / Marquez and Klitschko: Two of the Greats?